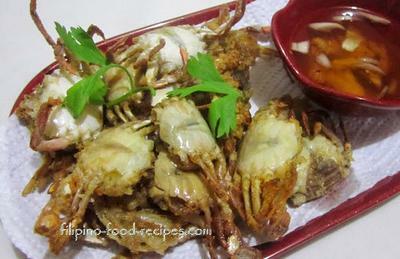 Crispy Crablet is a famous finger food and beer snack or pulutan. Crablets are young crabs, which are dredged in cornstarch and fried to a crisp -- so irresistible you can't help stuff your face bite after bite. I believe this is one of the specialties of the Iloilo province where crabs are in abundance, that they are often found in the riverbanks and some fish ponds. For those with no access to crablets, try buying the cleaned and frozen soft-shell crabs -- a little pricey but well worth it. Note : Substitute Magic Sarap and salt with the all-time crab partner : the Old Bay Seasoning. 1. 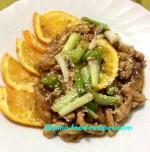 Mix cornstarch, salt, pepper and magic sarap. Set aside. 2. Place the crablets in a bowl with ice and water. 3. Drain and dredge the crablets in cornstarch. 5. Serve with spicy vinegar dipping sauce with garlic.